"e;This work strikes a balance between the pure functional aspects of F# and the object-oriented and imperative features that make it so useful in practice, enable .NET integration, and make large-scale data processing possible. "e; Thore Graepel, PhD, Researcher, Microsoft Research Ltd. Over the next five years, F# is expected to become one of the world's most popular functional programmi… ng languages for scientists of all disciplines working on the Windows platform. F# is free and, unlike MATLAB and other software with numerical/scientific origins, is a full-fledged programming language. 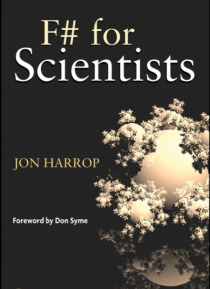 Developed in consultation with Don Syme of Microsoft Research Ltd. who wrote the language F# for Scientists explains and demonstrates the powerful features of this important new programming language. The book assumes no prior experience and guides the reader from the basics of computer programming to the implementation of state-of-the-art algorithms. F# for Scientists begins with coverage of introductory material in the areas of functional programming, .NET, and scientific computing, and goes on to explore: Program structure Optimization Data structures Libraries Numerical analysis Databases Input and output Interoperability Visualization Screenshots of development using Visual Studio are used to illustrate compilation, debugging, and interactive use, while complete examples of a few whole programs are included to give readers a complete view of F#'s capabilities. Written in a clear and concise style, F# for Scientists is well suited for researchers, scientists, and developers who want to program under the Windows platform. It also serves as an ideal supplemental text for advanced undergraduate and graduate students with a background in science or engineering.